Be the first to share your favorite memory, photo or story of Kelvin . This memorial page is dedicated for family, friends and future generations to celebrate the life of their loved one. Kelvin DeWhite Franklin (also known as “Kel”), the son of Mary and the late Elijah Franklin, began his earthly journey on August 23, 1958, in Newark, New Jersey. As a child, Kelvin lived with his family in Roselle, New Jersey, where he attended the public schools, graduating from Abraham Clark High School in 1976. He then attended Cheyney University and Kean University, where he received his Bachelor of Arts degree in Special Education. Kelvin’s first employment was with the Hillside, New Jersey, school district, followed by employment with the East Orange, New Jersey, school district as a Special Education Teacher/Crisis Intervention Counselor. 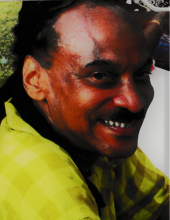 In 1993, Kelvin relocated to Silver Springs, Maryland, where he continued to work as a Special Education Teacher/Behavior Therapist with the Prince George’s County school district. He was also employed by PSI Associates (a day program for adults with disabilities) in Washington, DC, as a Case Manager/Behavior Therapist before being promoted to Assistant Program Director. In 1999, Kelvin relocated back to New Jersey, where he worked for the Community Psychiatric Institute (CPI), as a Clinical Social Worker for five years, and then for the State of New Jersey Division of Youth and Family Services (DYFS) as a Social Worker for three years. After retiring, he relocated to Marietta, Georgia, where he resided for a little over two years before returning back home to New Jersey. Although Kelvin enjoyed traveling and exploring other cities, he realized he wanted to be near his family. Kelvin was blessed with a God-given gift for touching the lives of others. People of all walks of life were drawn to his caring personality. He thoroughly enjoyed assisting others in attaining their goals. He was blessed with a good heart as well as a wonderful sense of humor. In his spare time, he volunteered at several local community organizations. Throughout his life, Kelvin trusted in the Lord and put Him first. His faith was extremely strong. Kelvin also cherished the fun moments he had with his family and friends. Kelvin DeWhite Franklin departed this life on Sunday, August 19, 2018, at his Orange, NJ, home. He was predeceased by his father, Elijah Franklin. Upon entering his new life, Kelvin leaves to treasure his memory one daughter, Sharonda Anderson; his beloved mother, Mary Franklin, Colonia, NJ; two grandsons, Shareif and Shakyle Anderson; three great grandchildren; two devoted sisters, Anita Farmer (Charles), Colonia, NJ, and Felicia Turner, Loganville, GA; and one loving brother, Elijah Franklin (Yolanda), Lincoln University, PA. He also leaves to cherish his memory one niece, Taliyah Turner, Loganville, GA; two nephews, Taevon Turner, Loganville, GA, and Dr. Charles B. Farmer, New York, NY; several aunts and uncles and a multitude of cousins and friends. "Email Address" would like to share the life celebration of Kelvin DeWhite Franklin. Click on the "link" to go to share a favorite memory or leave a condolence message for the family.